A business process enables a company to describe who does what and in which order. A process is a series of tasks performed in sequence with clearly defined inputs, intended to deliver an output. The output can be a service, a product, or some other organizational goal. By combining all the company’s business processes, we can describe how it operates. You can compare a business process with a recipe. Imagine you’re at home and want something other than a bowl of pasta or scrambled eggs for dinner. You’re in the mood for a treat, and look for a creamy gorgonzola risotto recipe. You download a recipe from the internet, and follow it to create the risotto dish, based on the written directions. No one’s there to supervise you or provide tips. A good recipe must be specific. Think again about your gorgonzola risotto. You had the recipe, but the risotto didn’t come out as planned. Why did that happen? Perhaps the recipe’s list of ingredients was not specific enough. Maybe the descriptions provided in each step were too vague. WHY DO BUSINESS PROCESSES MATTER TO A COMPANY? Business processes are key to describing how a company gets stuff done. 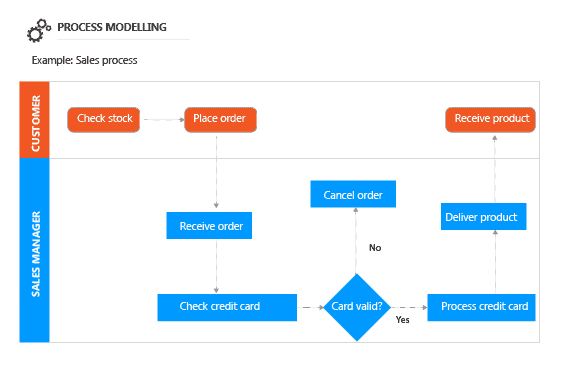 Paying a supplier’s bill or placing an order for a customer are both business processes. Good companies have documented processes. They enable consistent, high-quality outputs. By documenting their processes, companies can expand quickly. Companies that seek to expand through mergers and acquisitions need well-documented business processes to ease integrations and support joint business operations. Processes are also crucial for effective knowledge management. They can be used to teach new employees to perform required tasks and achieve desired outcomes. WHY ARE BUSINESS PROCESSES SO IMPORTANT FOR PLM? Business processes enable companies to develop, sell, deliver and support their products effectively. The quality of the processes across the product lifecycle strongly influences a product’s success. Waste in these processes can result in slower product deliveries and quality issues. HOW DO WE DEFINE A BUSINESS PROCESS? Business process management is an overall approach that helps to promote efficiency in a company. It involves documenting existing processes (Process Mapping), defining the future process (Process Modelling), implementing the defined processes (Process Deployment) and measuring the process (Process Monitoring). Business process mapping, modelling and monitoring are main activities in PLM. We use visual representations to show the way things work. In each of the steps there are activities, roles, deliverables and metrics that accurately define the tasks that needs to be performed. To create a business process map, we can use a process flow diagram containing activity “swimlanes”. The flow diagram shows a “swimlane” for each role and indicates the activities and events that each role executes. In this phase, the diagram shows the current situation. The following example represents the sales process of a small company. During this phase, we create an improved model for the processes the company wants to optimize. A model serves as a common framework for discussion and communication. It helps people understand how the process will work and where the optimizations come from. The following example represents the optimized sales process of a small company, after remodelling. After defining new processes, we need to implement them. In order to productively implement the changes, a training and support plan must be in place. After implementation, we move to constant business process management. But it is crucial to follow up the process and ensure we get adequate feedback: Does the new process work well? Do we need to adjust it? A good business process must be measurable. We use Key Performance Indicators (KPIs) to measure the process efficiency and implementation. A KPI is a metric, a quantifiable attribute that helps us describe the performance. It needs to be something that can be measured. KPIs help a company set targets and monitor the implementation progress and efficiency. WHAT DEFINES A GOOD BUSINESS PROCESS? It is important to keep business processes at the right level of detail. Companies sometimes mix up processes and methods. A process is a sequential set of high-level activities, with clear inputs and outputs. The methods define how to perform the actions involved in those process steps in the related information systems. Methods are more detailed, and system-specific. A good business process is one that is clear-cut, well documented and easy to understand. The activities of a process need to be crystal clear, as do the roles of the employees and the information they use and create. Anything that isn’t clear enough will lead to confusion and waste. Processes must be measurable and manageable. In other words, we need to be able to monitor, using data, to know whether the process is doing well or struggling. Business processes are the building blocks of any great organization. If you want people to work the “right” way, you need to define it in a business process. Well-managed business processes are a powerful corporate strategic asset.